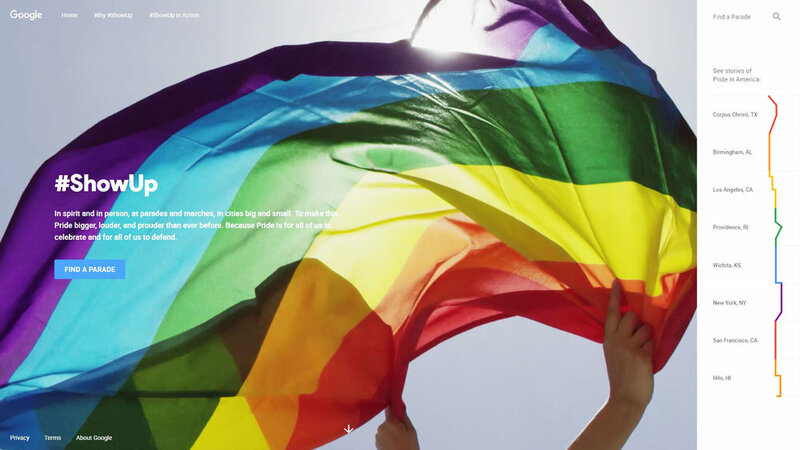 For Pride 2017, Google partnered with Stink Studios to create a campaign that would inspire people to show up and support the LGBTQ community. By visiting eight cities across America, the campaign captured individual video stories, marches and LGBTQ-supporting nonprofits for people looking to involved in their local events. I had the chance to be involved on Google Pride as a Lead Motion Designer, working closely with the Creative Tech team on all the UI animations and transitions. Because Pride is for all of us to celebrate and for all of us to defend, we designed an early prototype that was using the loading page to display the reasons why people are proud to show up. In an other prototype, we focused on helping the user to find quickly the nearest parades or marches in their communities. The user is invited to search for a city or a zip-code, as soon as he starts to edit the field, the results are showing up.